Given a Hexadecimal number, the task is to convert it into an Octal number. A hexadecimal number is a positional numeral system with a radix, or base, of 16 and uses sixteen distinct symbols. An octal number or oct for short is the base-8 number and uses the digits 0 to 7. Octal numerals can be made from binary numerals by grouping consecutive binary digits into groups of three (starting from the right). 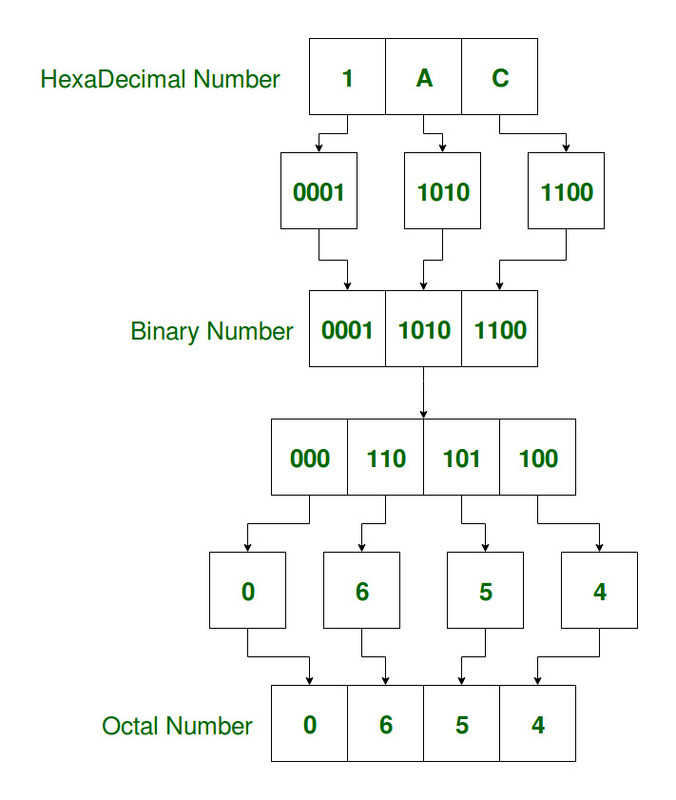 Find the equivalent binary number for each digit of the given hexadecimal number. Add 0’s to the left if any of the binary equivalent is shorter than 4 bits. Separate the binary digits into groups, each containing 3 bits or digits from right to left. Add 0s to the left, if the last group contains less than 3 bits. Find the octal equivalent for each binary group. first_page Is there any equivalent to typedef of C/C++ in Java ?